This is a project of the Demography, health and wellbeing research theme, part of the Vital Geographies thematic research group. These projects led by Prof Robert Bennett involve two streams: one focusing on small business and entrepreneurship from the nineteenth century to the present; a second stream focusing on small business and entrepreneurship support policies. 1. Estimating and interpreting the development of entrepreneurship, small business and firm-size distribution from the nineteenth century to the present. This is interconnected with the Cambridge Group for the History of Population and Social Structure (CAMPOP). We know little about business numbers and size-distribution in 19th century Britain. As a result, despite numerous studies of the 'industrial revolution', we know almost nothing about the large scale patterns of entrepreneurship, evolution of the business population, and how these relate to economic growth. This research stream aims to fill the gaps using a range of sources, create a large scale database of the British business population and entrepreneurs that can be accessed and used by researchers in the field, and interpret how entrepreneurship evolved during British development as 'The First Industrial Nation'. A methodological paper illustrates the creation of a first database from the 1881 census following a Leverhulme Trust pilot project. This research is now supported by a major ESRC project (ES/M010953) the Drivers of Entrepreneurship and Small Business which will have its own web pages later in 2017. A range of projects have demonstrated the way in which small businesses access and use advice, their locational needs, and the differences between different types of suppliers: such as commercial advisors (accountants, lawyers, consultants), business associations (chambers of commerce, sector trade associations), and public agents (e.g. British Business Link, LEPs). This stream is interconnected with the Cambridge Centre for Business Research (CBR) at the Judge Business School, supported by ESRC 1995-2004 and by a range of other sponsors subsequently. Main published outputs below. Full list of CBR reports and publications on CBR website. Major recent outputs focus on supports to SMEs in the UK, agencies such as SBA in the USA, and related organisations in other parts of the world. These themes have been developed in the book 'Entrepreneurship and small business policy', published June 2014. This expands on examples of the interface between the history of entrepreneurship, institutional developments of the 'business enabling environment', and small business policies using detailed studies from around the world. Bennett, R. J. (2014) Entrepreneurship and small business policy: Evolution or revolution, Routledge, London, Masters in Entrepreneurship Series; due June 2014. Bennett, R.J. (2012) Government and Small Business, Chapter 4, pp. 49-75, in S. Carter and D. Jones-Evans (eds.) Enterprise and Small Business, (2nd ed.) Financial Times/Pearson Education, Harlow. Bennett, R. J. (2012) Government advice services for SMEs: recognising and managing expectations - the lessons from British experience, Chapter 13 in R. Blackburn and M. Schaper (eds.) Government, SMEs and Entrepreneurship Development: Policy, Practice and Challenges, Gower. Bennett, R. J. (2008) Government SME policy since the 1990s: what have we learnt? Environment and Planning C: Government and Policy, 26, 375-397. Bennett, R. J. (2007) Government local and regional support for SMEs and Business Link, Chapter 7, pp. 75-88, in A. Cosh and A. Hughes (eds.) British Enterprise: thriving or surviving? Centre for Business Research, Judge Business School, Cambridge University. Bennett, R.J. and M. Ramsden, (2007)The contribution of business associations to SMEs: Strategy, bundling or reassurance?International Small Business Journal, 25 (1) 49-76. Bennett, R. J. and P. J. A. Robson (2005) The advisor-SME client relationship: an empirical test of a model of client impact, satisfaction and commitment, Small Business Economics, 25 (3), 255-271. Ramsden, M. and R. J. Bennett, (2005) The benefits of external supports to SMEs: "Hard" versus "soft" outcomes and satisfaction levels, Journal of Small Business and Enterprise Development, 12 (2), 227-243. Bennett, R.J. and Robson, P.J.A. (2004) The role of boards of directors in small and medium-sized firms, Journal of Small Business and Enterprise Development, 11 (1), 95-113. Bennett, R. J. and Robson, P. J. A. (2004) Support services for SMEs: does the 'franchisee' make a difference to the Business Link offer?, Environment and Planning C: Government and Policy, 22, 859-880. Bennett, R.J. and Robson, P.J.A. (2003) Changing use of external business advice and government support by SMEs in the 1990s, Regional Studies, 37, 795-811. Bennett, R. J. and Robson, P.J.A. (2003) External advice and Business Link, Chapter 5, pp. 57-71, in A. Cosh and A. Hughes, (eds) Enterprise challenged: Policy and Performance in the British SME sector, 1999 - 2002, Cambridge Centre for Business Research. Bennett, R.J. and Smith, C. (2003) The spatial market of business advice and consultancy to SMEs, Journal of Computers, Environment and Urban Systems, 27, 309-336. Bennett, R. J. & P.J.A. Robson (2000) External advice and business link, Chapter 8, pp. 77-86, in A. Cosh and A. Hughes (eds.) British Enterprise in Transition: Growth, innovation and public policy in the SME sector 1994-1999, ESRC University of Cambridge, Centre for Business Research. Bennett, R. J., D.J. Graham and W. Bratton (1999) The Location and Concentration of Businesses in Britain: Business Clusters, Business Services, Market Coverage and Local Economic Development, in Transaction Institute of British Geographers, 24, 293-420. Bennett, R. J. & P.J.A. Robson (1999) The use of external advice by SMEs in Britain, Entrepreneurship and Regional Development, 11, 155-180. Bennett, R. J. (1999) Explaining the membership of sectoral business associations, Environment and Planning A, 31, 877-898. Bennett, R. J. (1999) Business associations: their potential contribution to government policy and the growth of small and medium-sized enterprises, Environment and Planning C: Government and Policy, 17, 593-608. Bennett, R. J. & P.A. Robson (1999) Intensity of interaction in supply of business advice and client impact: a comparison of consultancy, business associations and government support initiatives for SMEs, British Journal of Management, 10, 351-369. Bennett, R. J. & P.A. Robson (1999) Business Link: use, satisfaction and comparison with business shop and business connect, Policy Studies, 20, 2, 107-132. Bennett, R. J. & P.A. Robson (1999) Central government support to SMEs compared to business link, business connect and business shop and the prospects for the Small Business Service, Regional Studies, 33, 379-787. Bennett, R. J. (1998) Business Associations and Economic Development: re-exploring an interface between the state and market, Environment and Planning A, 30, 1367-1387. Bennett, R. J. and D.A. Graham (1998) Explaining the size differentiation of business service centres, Urban Studies, 35, 9, 1457-1480. Bennett, R. J. (1998) Business Associations and their potential contribution to SMEs competitiveness, Entrepreneurship and Regional Development, 10, 243-260. Bennett, R. J. (1997) The relations between government and business associations in Britain: An evaluation of recent developments, Policy Studies, 18, 1, 5-33. Bennett, R. J. (1997) The impact of European Economic integration on business associations: The UK case, West European Politics, 20, 3, 61-90 (larger version published in Cambridge ESRC Centre for Business Research WP61). Bennett, R. J. (1997) Administrative systems and economic spaces, Regional Studies, 31, 3, 323-336. Bennett, R. J. (1997) Improving the economic and social environment for startups and SMEs: the case of Britain, pp. 9-52, in B. Lageman, H. Voelzkow and B von Rosenbladt (eds.) Möglichkeiten zur Yerbesserung des wirtschafts - und gesellschaftspolitischen Umfeldes für Existenzgründer und kleine und mittlere Unternehmen - Wege zu einer neuen Kultur der Selbständigkeit (Max-Planck - Institut für Gesellschaftsforchung, Köln). Bennett, R. J. (1996) The logic of local business associations: an analysis of voluntary Chambers of Commerce, Journal of Public Policy, 15, 3, 251-279. Bennett, R. J. (1996) Can transaction cost economics explain voluntary Chambers of Commerce?, Journal of Institutional and Theoretical Economics, 152, 4, 654-680. 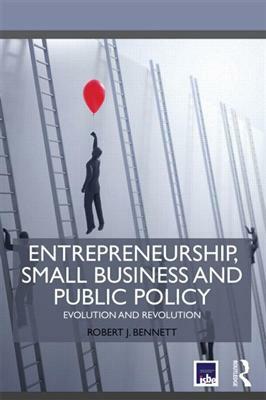 R. J. Bennett (2014) Entrepreneurship, Small Business and Public Policy: Evolution and Revolution, Routledge ISBE Masters in Entrepreneurship Series. June 2014. Outline: This is the first book to focus in-depth on government policies for entrepreneurship and small businesses across the world. It provides a balanced account, presenting the case for policies and their limitations. Theoretical rigour is complemented by detailed assessments of current policies in the USA, UK, the EU, Japan, S. Korea, China since the Plenum 'Decision' in November 2013, and developing and transition economies, as well as the policy supports from 'meta-institutions' like the World Bank, International Finance Corporation, UN, ILO, EBRD, EU, etc. The text covers all main specific policy instruments for entrepreneurial market entry and start-up support, ongoing small business advice and financial support, and business succession planning. It has particular emphasis on policies to improve the Business Enabling Environment through macroeconomic policy, institutional reform, and deregulation of bureaucratic burdens. The book places entrepreneurship policies in the context of barriers to change and the opportunities presented by historical tipping points. It argues that greater complementarity is needed between entrepreneurs, small and large businesses, greater use of corporate venturing and start-up finance through modern methods of crowd sourcing in advanced economies, and more venture capital participation by elites in developing economies and oligarchic systems. The book concludes that we are now at a technological tipping point where modern e- and m-commerce require adaptation of policy aims and delivery processes to simpler and lower cost approaches capable of diffusing more widely and more quickly.